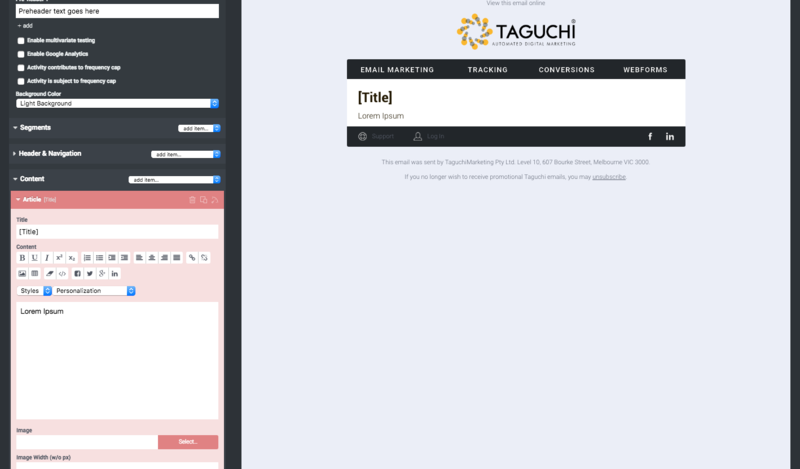 This document has been created by Taguchi® and is intended to be used for the purpose of training marketers in the use of the Taguchi® Digital Marketing system. The purpose of this document is to be a reference manual providing detailed information to support the creation of marketing emails within version 5. Taguchi® is a world-class, enterprise-level digital marketing platform. It integrates with a range of existing data sources. It has powerful analytics, sophisticated automation, and patented optimisation technology. But what sets Taguchi® even further apart is its ability to accurately predict your short and long-term ROI. Understanding the lifetime value of your database enables you to plan and implement your marketing strategies with more confidence than ever before. For marketers, retailers and publishers, Taguchi® is much more than a one-to-one communications tool. It’s a window to the future. If you require further assistance with Taguchi® V5, please visit our support portal. Alternatively you can raise a support ticket with our Australian based support team, Monday to Friday, 9am – 5:30pm AEST. Navigate to http://login.taguchi.com.au/ using a supported web browser (see below for supported browsers). The login screen will display with a username and password field, enter in your details and click 'Log In'. 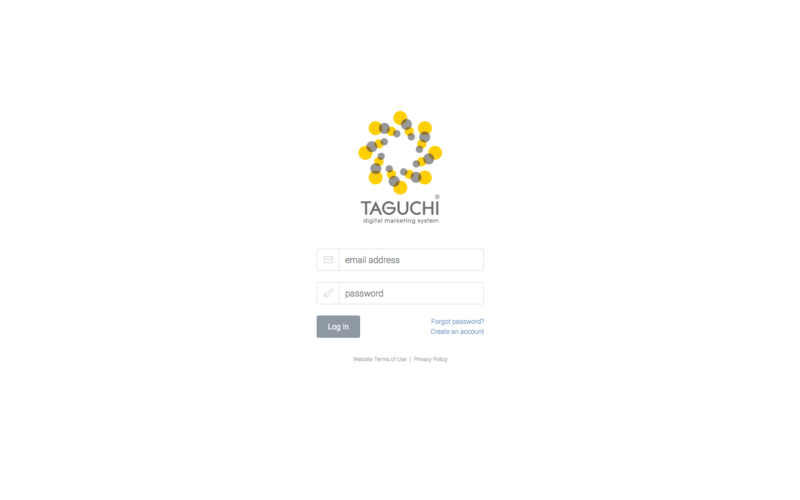 If you do not have a username and password for Taguchi® version 5 yet, please ask a team member in your company who is a Taguchi® administrator to add you to the organisation. After they have added your account, you will be sent further instructions on how to set a password and log in to Taguchi. Alternatively, if you have a Taguchi® V4 account, and your organisation has V5 access enabled, you can follow the instructions here on how to create a Taguchi® V5 account and link your existing organisation to it. If you have forgotten your password, simply navigate to the log in screen, click the 'Forgot password?' link, fill in your email address and click the 'Reset password' button. An email will be sent to you with details on how to reset your password, simply follow the instructions within the email to reset your password. The password reset email can take up to ten minutes to reach your inbox. Taguchi v5 is supported on most current devices (including mobile devices) and up-to-date web browsers. Two-factor authentication (also known as 2FA) is a method of confirming a user's claimed identity by utilizing a combination of two different components. This authentication process occurs every time you log in. 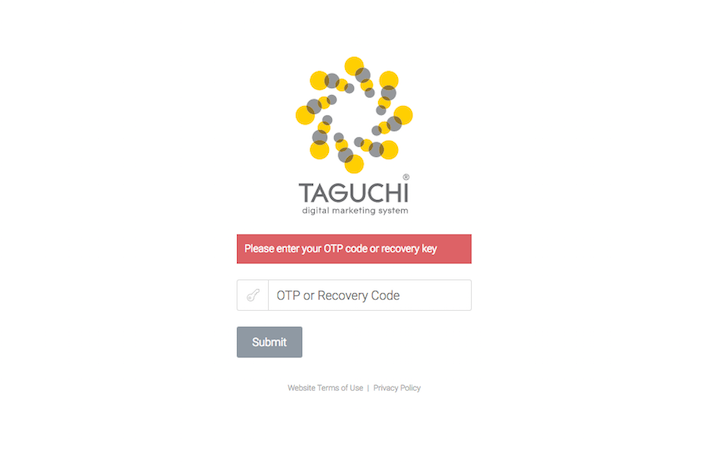 Taguchi® has adopted two-factor authentication via QR code (or manual entry by account ID and key). This means you can set up 2FA easily using your mobile device and an app (such as Google Authenticator available on the App Store or Play Store). To set up 2FA on your account, simply head to the Account details section and enable two-factor authentication by toggling the switch. Scan the QR code using a compatible mobile device and an authentication application. Ensure you download your recovery codes and either print or save the codes in a secure place. When logging in to Taguchi® v5, you will be asked to input a 6-digit code (or recovery code) to authenticate before continuing. Simply open your authentication application and input the current code displayed to continue logging in before redirecting to your Dashboard. The correct timezone (date and time) have an impact on whether the authentication application will display the correct code on your mobile device. Ensure you have the correct date and time on your mobile device, ideally set the timezone to 'Automatic'. 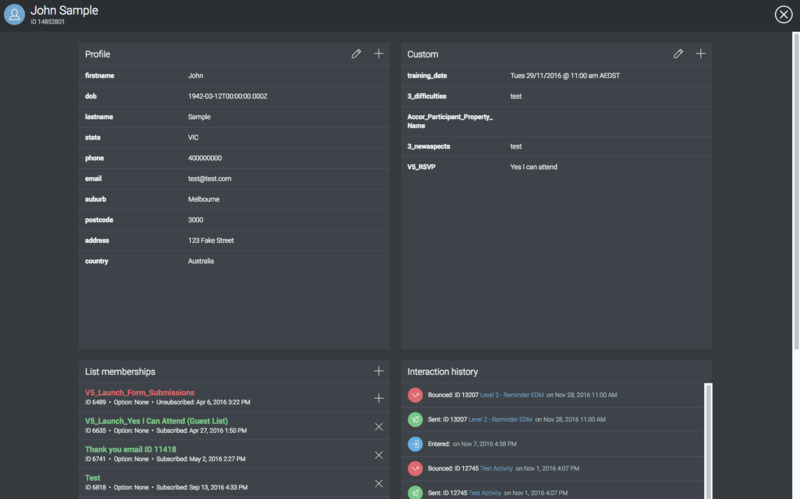 The user interface on desktop consists of the left side menu (containing links to the Dashboard, Campaigns, Subscribers and Settings) and the top header bar (consisting of a global search input, links to support, your user profile and the notifications panel). Taguchi® v5 introduces global search to your organisation. You can search for subscribers, campaigns and activities. This makes searching for particular items or subscribers easy. The notifications panel can be found by clicking the notifications icon located in the top-right corner of the header bar. The notification icon may also have a coloured dot which symbolises the type of unread notifications requiring action. A red dot alerts you of any unread error notifications (such as reports or extracts failing to generate), whereas a green dot symbolises any general unread notifications. The dot will disappear after clicking on the notification icon and expanding the notification panel. Predicted numbers used within Taguchi® are derived from a hybrid BG/NBD + Weibull model with parameters optimized daily via L-BFGS-B; they indicate the expected number of engagements (opens/clicks) or conversions from current subscribers over the coming 3-year period assuming the communication frequency and effectiveness remains in line with current performance. The predictions Taguchi® make are directionally quite accurate, but limited in absolute accuracy. For example, if today it's saying your estimated future conversion is $50M, and next week it says $55M, that's measuring a real increase in the conversion performance of your database, either due to your email strategy (communication frequency etc) or your acquisition quality. For example, if either the predictive engagement or predictive conversions line is trending up in your activity, campaign or list reports, you can be confident that your strategy is working. Keeping in mind the assumptions that go into the absolute conversion value are not going to be replicated in reality, because you may change your strategy and you will acquire new subscribers over time that could potentially change the predictive outcomes. The notifications panel slides from the right and shows current activity and extract download links. The dashboard is your first point of reference when logging in to Taguchi®. It contains a general overview of all operations within your organisation. 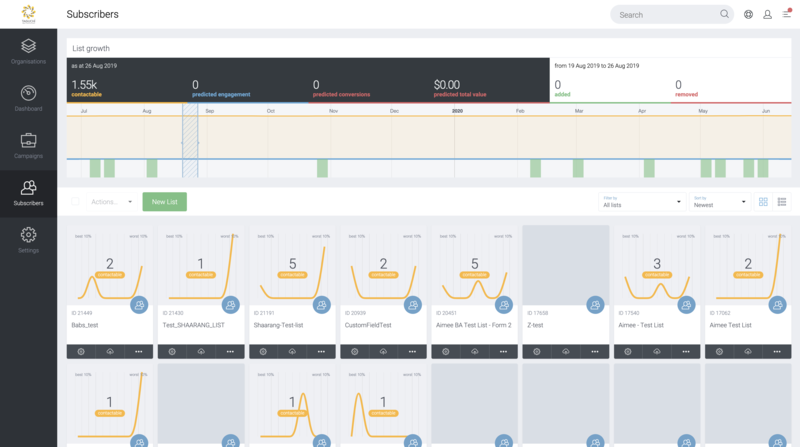 The interactive graph at the top of your dashboard gives you a year-to-date overview of your subscriber engagement. The shaded area represents one week, click and drag this shaded area along the graph to see statistics relating to that weekly range. To the right of the interactive graph, you will find a schedule. This schedule shows you a date arranged layout of any scheduled activities (activities that are due to broadcast). Further down the page you will find a tiled (or list depending on your display preferences) layout which shows recent activities. Click the dropdown box in the top left corner to change the view from 'Recent activities' to either 'Recently deployed', 'Recently modified' or 'Recently archived'. 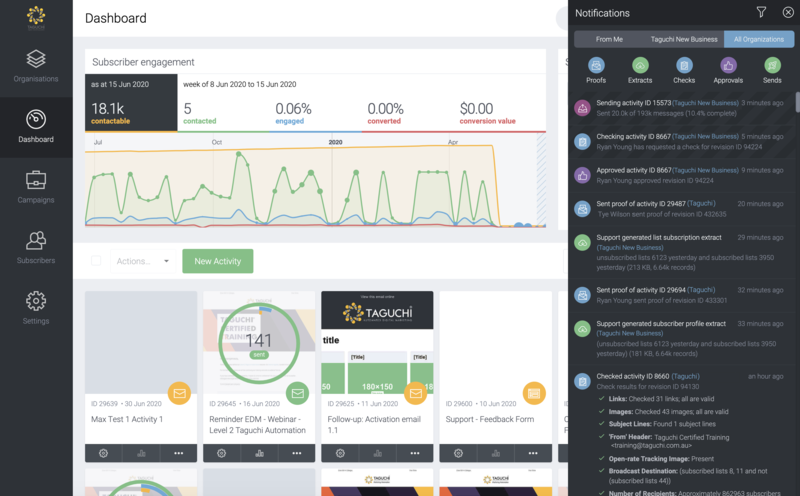 The dashboard contains an overview of your organisation within Taguchi. Campaigns are the primary tool Taguchi® provides to enable organisations of online marketing activities. Similar to the campaign structures offered by Google AdWords or OpenAds, Taguchi® campaigns represent a grouping of individual email broadcasts, triggered email messages, and web pages. The individual elements grouped within are referred to as Activities (this is explained further in Part 2). A Campaign can include a mix of activity types; for instance, a Newsletter Campaign might contain a series of weekly broadcast emails, a web page to manage subscription status, and a triggered email to provide confirmation of sign-up. Other Campaigns could include a series of triggered emails sent periodically to new subscribers, with broadcast emails in support of those. 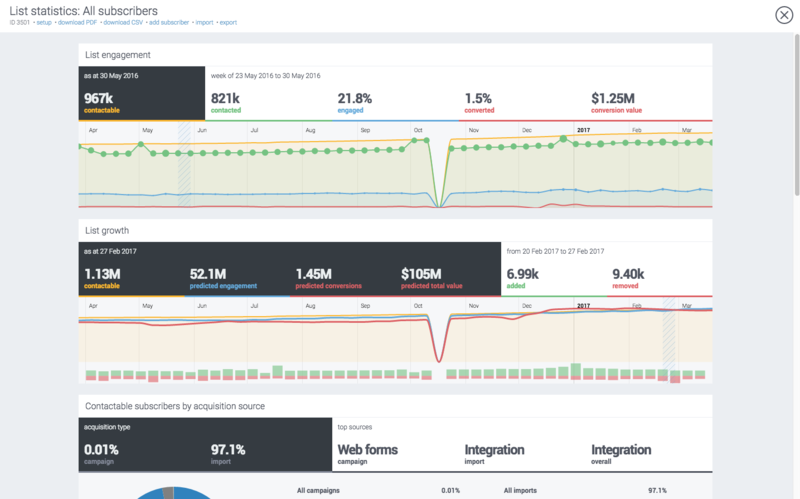 This structure provides roll-up reporting of performance — including conversion and subscription rate data, across a set of marketing activities. 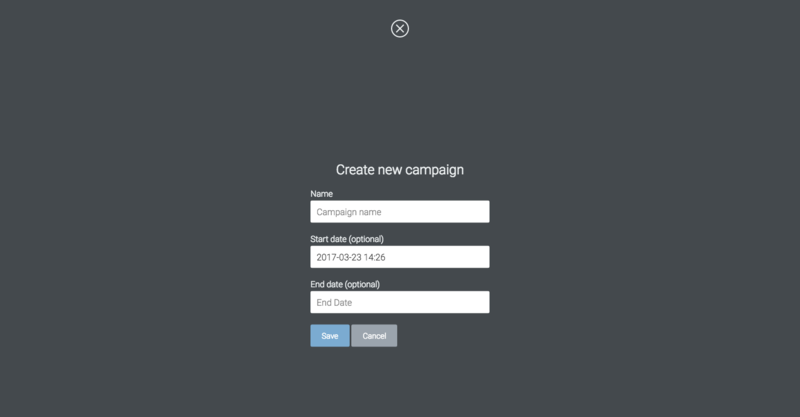 Campaigns are created by clicking the ‘New Campaign’ button. A simple light box form is opened and the Campaign’s display name (the name given to the Campaign in the UI) must be provided. This name can be changed later using the Campaign Detail view. Select a date and time for easy identification post campaign. This date may not be the date the activity is actually broadcasted or scheduled. We recommend using a logical description, as well as any marketing reference codes, job number codes that will help identify the campaign in future e.g. J1257 Launch Campaign. When the ‘Create’ button is clicked, the detail view for the newly created Campaign is shown. The Campaign dates and title can be edited later by clicking the ‘Setup’ link under the Title. Every campaign created displays a unique Campaign ID which is a simple way of referencing. The 'Create new campaign' modal window will display. Enter in the required details and click 'save'. Click the 'Actions' gear icon in the lower right corner of a campaign tile to access the campaign actions. From here, you can access campaign specific actions such as deleting or archiving the campaign. If you wish to edit the campaign name or dates, click the 'Setup' link. A modal will appear where you can edit the required fields. To delete the campaign permanently, click the 'Delete' link. This will delete the campaign. If you accidentally deleted the campaign, simply click the 'Undo' button in the bottom left corner of the screen after deleting the item. To change the campaigns status from active to archived, simply click the 'Archive' link. This will place the campaign under the 'Archived campaigns' filter. 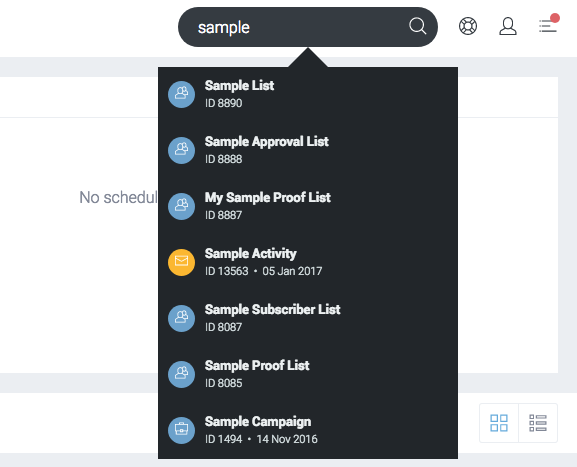 You can access your archived campaigns by changing the view from 'All Campaigns' to 'Archived Campaigns' in the top left corner of the campaigns view using the 'Filter by' function. To Unarchive a campaign, filter campaigns by 'Archived campaigns', click on the activity you want to un-archive and click the 'Archive' link, then the 'Undo' button. Click the 'Actions' gear icon in the lower right corner of a campaign tile to access the campaign actions. From here, you can access multiple campaign report options. Campaign reports display the entire history (date range) of the campaign. To view date specific report data, please use the online report with the interactive graph. Custom reports may also be acquired (subject to scoping and requirements), please contact Taguchi® Support for more information. The total number of email/SMS messages sent via all activities in this campaign. The number of messages opened across all activities in this campaign, expressed as a proportion of the number of messages sent. Note that a recipient can open a message multiple times, but this will only be recorded as a single unique open. The number of messages clicked, expressed as a proportion of the number of messages sent. Note that a recipient can click on links in a message multiple times, but this will only be recorded as a single unique click. Total number of conversions that resulted from all activities in this campaign, expressed as a percentage of the number of messages sent. The total conversion value of all activities within this campaign (all conversions). The average conversion value per message sent. To download a PDF report for your campaign, simply click the 'PDF' link under 'Reports'. A PDF file should start downloading shortly to your computer. To download a CSV report for your campaign, simply click the 'CSV' link under 'Reports'. A CSV file should start downloading shortly to your computer. Clicking the 'View online' link will launch an online interactive graph report. An activity is an individual broadcast email, a triggered message, or a web page - a stand-alone marketing message to which a subscriber can respond. Activities form the building blocks of a campaign, and can be linked together to create a logical sequence of related messages to maximise engagement. Activities are designed to be re-useable with little modification and Taguchi® provides a number of systems to enable content and images to be updated quickly and easily. The activity types supported by Taguchi® are email (triggered and broadcast), web page, and SMS (triggered and broadcast). Activities are created within the Campaign detail view. Activities are created by clicking the 'New Activity’ button. When selecting a name, we recommend using a logical eDM description. This can be followed by the broadcast date or reference job number. If scheduled trigger is selected, add a start date and time for the activity to be deployed. Select a trigger interval; hourly, daily, weekly, or monthly and a subscriber send frequency. If event-based trigger is selected, add a start date and time for the activity to be deployed. Select a trigger event e.g. being sent an activity, select the activity, and a time delay between event and send and a subscriber send frequency. Once the ‘Save’ button has been clicked, the Activity is created. Click the Activity tile and the Activity page will load where the setup process begins. Every activity created displays a unique Activity ID which is a simple way of referencing. Click the 'Actions' gear icon in the lower right corner of an activity tile to access the activity actions. From here, you can access activity specific actions such as targeting, editing, deleting or archiving the activity. If you wish to edit the activity details, schedule your triggers or broadcasts, add notes, or edit the activity subscriber targeting options, click the 'Setup & Target' link. A modal will appear where you can edit these settings. This will launch the activity edit interface where you can edit the activities content. To delete the activity permanently, click the 'Delete' link. This will delete the activity. If you accidentally deleted the activity, simply click the 'Undo' button in the bottom left corner of the screen after deleting the item. To change the activity status from active to archived, simply click the 'Archive' link. This will place the activity under the 'Archived' filter view. You can access your archived activities by changing the view from 'Recent Activities' to 'Archived Activities' in the top left corner of the campaign folder. To unarchive a campaign, in the 'Recently archived activites' view, click the name of the activity, click the 'Archive' link, then click the 'Undo' button. If you wish to copy the contents of the activity to a new activity, you may clone the activity by clicking the 'Clone' link, this will create a new activity with the name prepended with 'Clone of'. You may download a HTML file of your activity by clicking the 'Download' link under the 'Content' title. If you click the 'Related' icon in the lower right corner of the activity title in the 'Actions' state, you will find a new tile with the campaign, target expression and template used. Click the 'Actions' gear icon in the lower right corner of an activity tile to access the activity actions. From here, you can access multiple activity report options. Activity reports display the entire history (date range) of the activity. To view date specific report data, please use the online report with the interactive graph. Custom reports may also be acquired (subject to scoping and requirements), please contact Taguchi® Support for more information. The first graph you will see is the 'Overall performance' graph. This graph is handy in displaying a general overview of your activity over the entire duration (from send date, to present). The total number of email/SMS messages sent. The total number of messages that bounced (were undeliverable). The number of messages that bounced, expressed as a percentage of the number of messages sent. The total number of subscribers that have unsubscribed through this activity. The number of messages opened, expressed as a proportion of the number of messages sent. Note that a recipient can open a message multiple times, but this will only be recorded as a single unique open. The total number of times messages were opened, expressed as a percentage of the number of messages sent. If messages were opened more than once on average, this number will exceed 100%. The total number of times links in this message were clicked, expressed as a percentage of messages sent. This counts individual clicks on multiple links within a message, as well as multiple clicks on a single link within a message. If an average of more than 1 click has resulted from each message, this number will exceed 100%. Total number of conversions that have occurred as a result of this activity, expressed as a proportion of messages sent. The average value of a conversion resulting from this activity. The total conversion value of this activity (all conversions). This is an interactive graph allowing you to expand and contract the selected area using your mouse. The numbers shown above the graph reflect the selected date range. This graph is useful for seeing how well your email performs after the send date. The total number of email/SMS messages sent during the selected date range. The number of messages that bounced (were undeliverable) during the selected date range. The number of messages opened during the selected date range. A subscriber can open a message multiple times, but this will only be recorded as a single unique open. The number of messages clicked during the selected date range. A subscriber can click links within a message multiple times, but this will only be recorded as a single unique click. The number of conversions that resulted from this activity during the selected date range. The total conversion value of this activity during the selected date range (all conversions). This graph shows the email clients and devices used to view the eDM. This graph is represented by a pie graph and the colour values are assigned to the right of the graph. The top clients are displayed above the graph for desktop, mobile and overall. 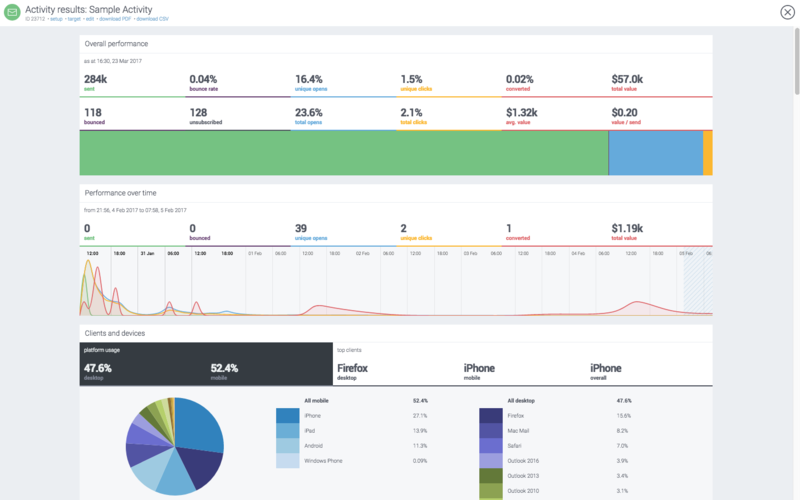 A percentile is displayed to show the device spread between mobile and desktop. This is a useful statistic to know if you wish to cater your template/activities to be more mobile friendly. This section shows you the click-through performance for each of the links contained in your eDM. Each link is listed with a percentage representing the total clicks. The number of unique, individual recipients who clicked on at least one link in the eDM, divided by the number of emails which were accepted by the recipient's mail servers. The total number of times links within the emails were clicked by recipients. The number of clicks on the message, expressed as a proportion of the number of unique opens. This measures the average number of clicks per recipient who opened the eDM. Conversion-to-click is the percentage of clicks that resulted in conversions. Average value per click is the average conversion value per click. If your eDM has multiple content or subject line versions/combinations, this section will display the performance of each variation and compare the best and worst percentile. Percentiles consist of those who received the full send (or defined combination), split into ten equal percentiles (100% ÷ 10). When broken down, each percentile is split using it's key performing metrics such as engagement metrics and conversion metrics. The charts at the bottom show how each combination performed across the engagement deciles of those who received it. To decline on the left, bottom on the right. To read more about using value predicates in target expressions and to see the full syntax, please read the full target expression reference. Row 1 - The green coloured row corresponds to the green graph line and represents the percentage of total sent within that 10%. Row 2 - The blue coloured row corresponds to the blue graph line and represents the percentage of unique opens within that 10%. Row 3 - The yellow coloured row corresponds to the yellow graph line and represents the percentage of unique clicks within that 10%. Row 4 - The red coloured row corresponds to the red graph line and represents the percentage of conversions within that 10%. To see a more visual representation of clicks, a heatmap and clickmap (total or %) is available. A colour injected heatmap will display on top of your activity content and will reflect the eDM activity recorded. You can change the version/combination and change any test account variables in the top right corner. The top right corner contains a dropdown to switch between desktop and mobile views, along with a dropdown to change the map type (heatmap or click map). 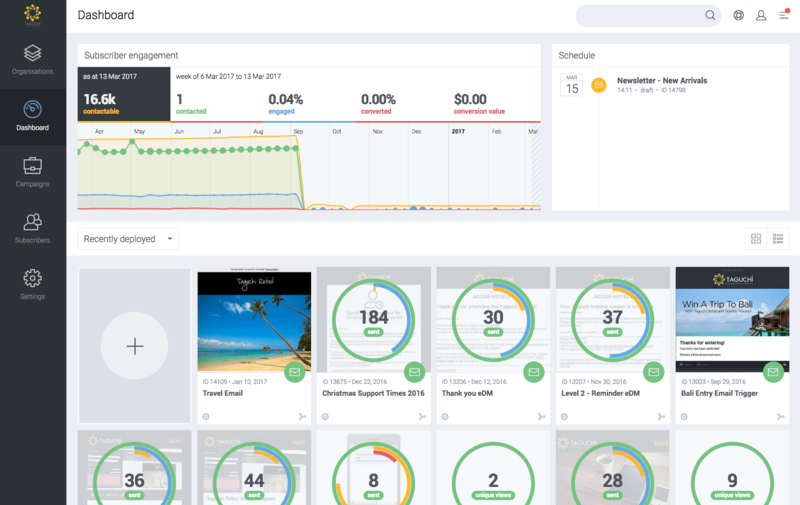 A sample view of an online activity report. To begin targeting subscribers for your activity, select 'Setup & Target' from either the activity card or within any activity window. This will launch the activity target modal. Taguchi® uses target expressions to accurately target relevant subscribers from within your subscriber database. The target expression is very powerful in targeting the subscribers you wish to refine. You have the option of using the step-by-step targeting options by selecting relevant values in the dropdown boxes, or you can manually type a target expression in the top text field. To read more about target expressions and see the full syntax, please click here. If you enter in a target expression manually and it does not match any target expression syntax, an error message will appear and you will be unable to save the target expression until it is fixed. The Activity Edit Interface is shown next to a preview of the activity. The preview pane is updated each time the content is saved, so when the view first loads the preview will not be displayed. In the case of especially wide email templates, one edge of the view might be cut off. Depending on the template and activity type, different fields will be displayed in the Activity Edit Interface. The content blocks developed vary across your all of your templates. Template selection is the first step of the web page and triggered message setup process, and the second step of the broadcast setup process. Usually when setting up an activity, you will select a template during the setup phase. If you wish to change the template within the activity edit interface, you can also use this interface (pictured). The interface shown simply lists the Templates available for the current activity type. To select a Template click on the template panel. A pop up box appears. Simply click on a template’s preview image or title to select it. Please note that old XSLT templates are not supported by Taguchi® v5. Please contact Taguchi® Support to discuss upgrading to a JS Template. A light box appears showing all available templates to select from. 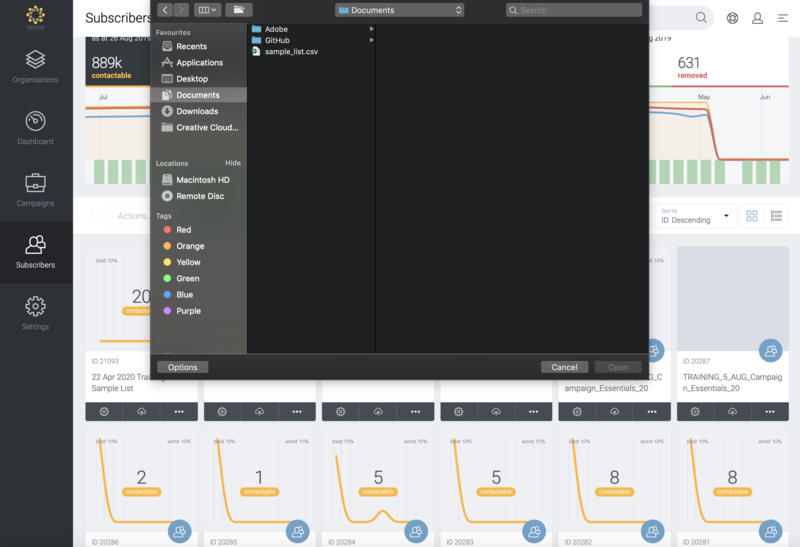 Just below the Activity Edit Timeline area, in the grey panel there is a cell called ‘Subject 1’. For example the subject line has entered as “Spring getaways from $358 per couple”, but this can be changed by simply re-typing the subject line copy that currently appears in the ‘Subject 1’ cell. When the subject line is present, the ‘optimize’ link can be clicked to display multiple subject lines; additional subject line alternatives can be added or removed. Taguchi® will automatically split-test these alternatives as it sends the broadcast, or as messages are triggered. 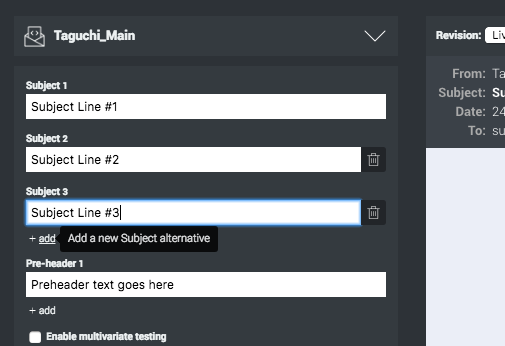 Unless your SMART Template has been customised to do otherwise the Taguchi® optimizer will try and send more of email containing the most subject line (as determined by the open or click through rates). The optimizer’s ability to respond to subscriber open and click behaviour will vary according to the variation in subscriber response, size of the email and speed of the broadcast. Easily change the subject line using the Subject cells. In the grey-bordered section called the ‘Main Content section’, you can use the ‘add item...’ dropdown menu at the top-right corner of the content block, to add the previously mentioned content item blocks. Once an item has been added, its details can be modified, and its position relative to other items can be changed by ‘dragging and dropping’ the item header bar (between the item type on the left and the ‘delete’ button on the right). 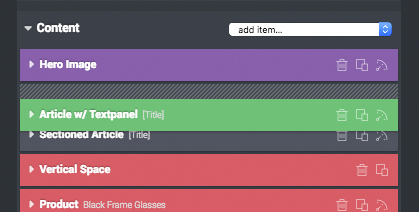 Items can also be dragged to other content blocks (for example, between a Main Content area and a Sidebar area), provided the item type is available in both. After updating item details, or re-ordering items within the email, click any of the orange ‘Save’ buttons (top or bottom of the page) to save the changes, and the content is then updated in the preview pane. Please note that if multiple users are editing an activity simultaneously, the changes made by each user will overwrite any previous changes. Select a block to add to the template from the dropdown box in the top right corner of the 'Content' channel. To enter marketing copy in the respective Content Blocks such as Intro Articles or Article Blocks, it is a matter of simply typing this directly into the cell in the Wizard Editor. If you copy and paste directly from MS Word, MS Word styles its text with invisible XML and as a result may cause the font to render incorrectly. This is because it carries over ‘junk’ code. To ensure your intended copy renders correctly, paste the copy into a Text File or a Note Pad Editor first, before importing in the copy cell in the Content block. Taguchi® has added a new ‘sanitize’ filter to the Content text fields. This should automatically clean out any junk code from MS Word, Photoshop, Dreamweaver etc. It does a fairly good job, however it’s not 100% perfect. If you do encounter this problem, then the easiest way to fix this is to click on the ‘HTML’ view button </> in the Content section of the affected Intro block, and delete everything except for the actual content you require. To add an image to an Article Block, click on the grey ‘Select’ button next to the ‘Image’ cell in the content block. The following pop-up box appears. Click on the ‘Choose File’ button and select the appropriate image from your image library. Then ‘Save’ your changes. Supported image formats are JPEG, GIF and PNG. Click the 'Select...' button and launch the file browser to select an image to upload. Adding Hypertext Links to the articles enables you newsletter subscriber to click on a link which will automatically directed them to another website, landing page, microsite or online information portal. To create the link, type in the description of the article you would like the reader to see in the newsletter. In the Editor section of the article block, make sure that you highlight the ‘article copy’ with you mouse and at the same time click on the icon with the chain and the green plus sign. Click on the grey ‘Update’ button. Highlight a word or words in the textarea, click the 'link' icon in the WYSIWYG editor and fill in the information required. To create a RTE pop up in a newsletter article for an email address, the email format that needs to entered in the product content cell will need to be the following: mailto:email@example.org The next step is to turn off link tracking for that email address. To do this, they need to go into HTML mode. Click on the blue HTML button which is the forth icon from the left hand side. The subscribers tab area contains the functionality associated with adding, managing, reporting and extracting subscriber data. Your subscriber records in the Taguchi® system are managed in a single customer database for your organisation. For marketing and communication purposes, this single database can be divided into multiple separate target lists referred to as ‘Subscriber Lists’. Subscriber Lists are created within the Subscribers section. You can create a new subscriber list by clicking the 'New List' button. 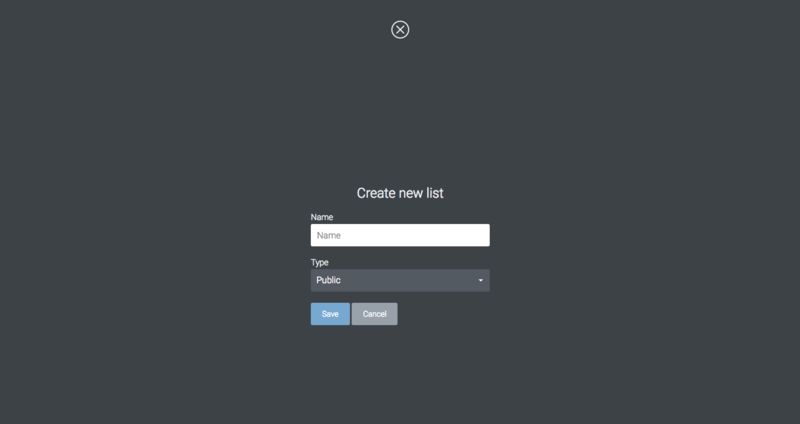 The 'Create new list' screen will launch with the option to add a list name and define the list type. These lists are ideal for uploading your main subscribers. This list type is used for when you send activity proofs, you may create a proof list and add subscribers to it. When you initiate a proof and select the proof list, all of the subscriber within that proof list will receive the email proof. Approval lists are ideal for requesting approval from coworkers or managers within your company. You can request approval within an activity and nominate an approval list to which the request should be sent. Notification lists are used for receiving custom extract, report and other notifications via email. Please contact Taguchi Support if you wish to utilise a notification list for a custom extract/report/other. Click the 'Actions' gear icon in the lower left corner of a subscriber list. 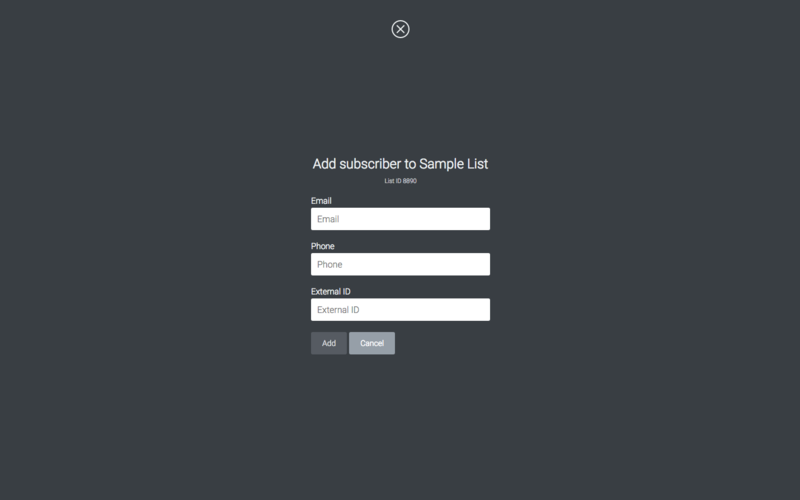 This will show the Actions menu where you can control and manage your subscriber list easily. If you wish to change your list name or change the list type, you can do so by clicking 'Setup' which will launch the edit window. To permanently delete your subscriber list, simply press the 'Delete' link. This will remove the subscriber list itself but will not delete the subscribers within your subscriber list. If you accidentally delete a subscriber list, this can be easily undone immediately after deleting the subscriber list by clicking the 'Undo' link in the notification popup in the bottom left of your screen. To change the subscriber list status from active to archived, simply click the 'Archive' link. This will move the list to your archive. You can access your archived lists by changing the view from 'All Lists' to 'Archived Lists' in the top left corner of the subscriber section. To unarchive a subscriber list, in the 'Archived Lists' view, click the subscriber list that you want to unarchive, click 'Archive' and click the 'Undo' button. If you wish to import subscribers from an external file, Taguchi® supports multiple file types including XLSX (Microsoft Excel), CSV (Comma Separated Values) and TSV (Tab Separated Values). Your subscribers must contain at least one email address, phone number or a unique ID as these fields are used as a primary unique identifier for the subscriber. Your file may contain any number of fields, these fields can be matched up with Taguchi® standard subscriber fields or can be assigned as either a new or existing custom field. To begin importing your subscribers, simply navigate to the Subscribers section and locate the subscriber list you wish to upload the subscribers into. Click the 'Actions' gear icon in the lower left corner of the subscriber list tile and select 'Import' under Subscribers. A file explorer dialog will appear where you can navigate your computers file directory to locate the file where your subscribers are contained. Select your file and click 'Open'. A popup screen will show displaying the data within the file you selected. The data is displayed in a table where you can scroll left-to-right to see all of the available columns. Each column has a dropdown box at the top of the column title, this is where you assign a column to a Taguchi® standard field or custom field. Ensure you assign each column to a field, otherwise the column will be ignored when the import occurs. After assigning each column with a Taguchi® standard field or custom field, click 'Import' to begin the import process. A progress bar will appear showing the total amount of subscribers that have been actioned. The green number and section simulates the total number of new subscribers that have been added to the database. The blue simulates subscribers that already exist in your database, but have been updated with the data included in this import. Any red simulates an error with a subscriber and the subscriber has not been imported. Purple signifies no change (where the subscriber is already in the subscriber list and database and the data has not been changed). After the import is complete, you may close out of the import window by clicking the 'X' in the top right corner. 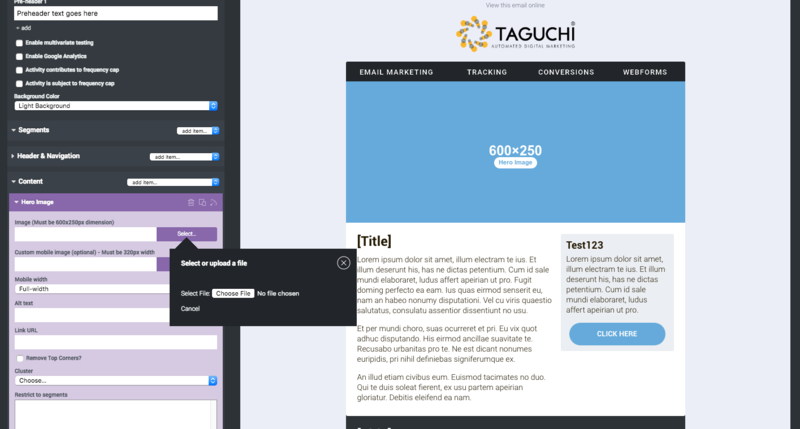 Taguchi's Subscriber API gives you a programmatic approach to add subscribers to your database. The API can be used to automate subscriber additions and to assist in larger imports of over 150,000 records. API documentation is available via the Documentation section of our support portal. Additional wrappers in multiple programming languages are also available for easy integration to existing systems. Taguchi® can also set up custom import processes to pull files from a FTP/FTPS/SFTP server. These import processes need to be specified, scoped and implemented directly with Taguchi® Technical support services. This type of import is ideal for larger imports of over 150,000 records. If you wish to add a small quantity of subscribers, you may add a subscriber one at a time using the 'Add' link under the Subscriber List Actions. You must populate at least one or more of these fields in order to add a subscriber. After the subscriber has been added, their profile will automatically load allowing you to edit the standard and custom fields and personalise the subscribers list subscription. If you wish to export a subscriber list for reporting or external use, you can do so by clicking the 'Export' link under the Subscriber Actions tile. A popup modal window will appear with the target expression engine visible and the list pre-populated in the target expression. 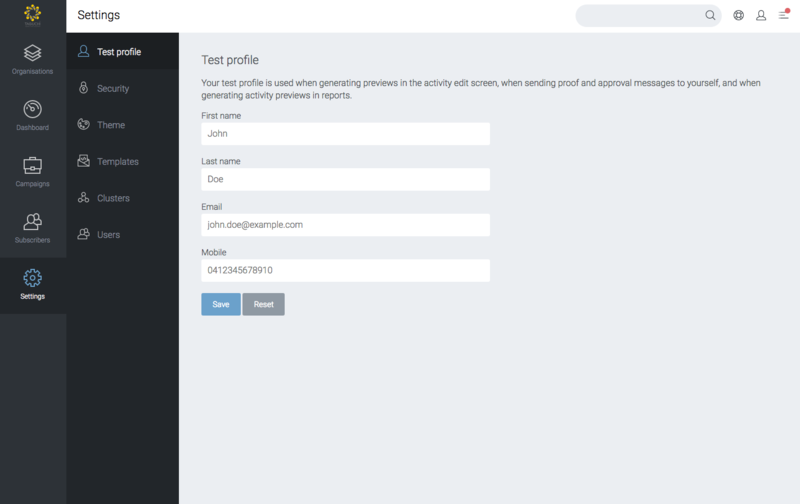 This extract will display all subscriber profile fields within the extract. This extract will display all subscriber profile fields along with a list subscription column detailing the date and time when the subscriber was added to the assigned list. Click the 'Actions' gear icon in the lower right corner of a subscriber list tile to access the Actions tile. From here, you can access multiple subscriber list report options. Subscriber list reports display the entire history (date range) of the list. To view date specific report data, please use the online report with the interactive graph. Custom reports may also be acquired (subject to scoping and requirements), please contact Taguchi® Support for more information. The first graph displayed is the List Engagement graph. This graph is interactive which means you can drag the shaded area on the graph left-to-right to manipulate the statistics shown by week. Subscribers who have a valid and active email address or phone number within this list. Subscribers who were contacted via a broadcast or triggered activity over the selected time period. Subscribers that have opened, viewed and/or clicked within the selected time period. Subscribers that converted within the selected time period. The total conversion value over the selected time period. This graph shows the growth if the list over the entire history of the subscriber list (from when it was created, up until today). This graph is also interactive which means you can slide the shaded area, and expand/contract the shaded area to specify a date range. The predicted total engagement (clicks, opens, views) of the subscribers within this list over the coming 3-year period. The predicted total conversion count over the coming 3-year period. The predicted total value of this list (using predicted conversion counts and average conversion values) over the coming 3-year period. The number of subscribers added to the list over the selected time period. The number of subscribers removed (unsubscribed, invalid) from this list over the selected time period. This section details the acquisition sources of the subscriber list and which sources contribute the most of the subscriber list growth. The pie chart on the left gives you a visual representation of the acquisition sources, whilst the tables on the right outline the acquisition sources by campaign (web forms) and by import files. Total number of subscribers from this acquisition source who have a valid and active email address or phone number. Total number of subscribers from this acquisition source who do not have a valid email address or phone number. Total number of subscribers from this acquisition source who are unsubscribed either globally or from this list. The predicted number of opens, clicks and page views resulting from messages sent to subscribers from this source, over the coming 3-year period. Total number of conversions from subscribers from this source. Total value of all conversions from subscribers from this source. The predicted total value of all conversions from subscribers from this acquisition source (using predicted conversion counts and average conversion values) over the coming 3-year period. The average total conversion value per subscriber from this acquisition source. The predicted average total conversion value per subscriber from this acquisition source, over the coming 3-year period. Total number of sources used to compile the subscribers of this list. The total value of all conversions from subscribers to this list. The average value of a conversion from subscribers to this list. The predicted total value of all subscribers to this list (using predicted conversion counts and average conversion values) over the coming 3-year period. The predicted average value of a conversion from all subscribers to this list over the coming 3-year period. The decile performance graphs give you stats on the best (most engaged) 10% of the subscriber list, all the way down to the worst (least engaged) 10% of the subscriber list. Deciles consist of those who are subscribed to the subscriber list, split into ten equal deciles (100% ÷ 10). When broken down, each decile is split using it's key performing metrics such as engagement metrics and conversion metrics. These are represented in the graph below. The charts at the bottom show how each combination performed across the engagement deciles of those who received sends using the subscriber list. To decline on the left, bottom on the right. Row 1 - The yellow coloured row corresponds to the yellow graph line and represents the number of contactable subscribers within that 10%. Row 2 - The blue coloured row corresponds to the blue graph line and represents the predicted future engagement within that 10%. Row 3 - The first red row corresponds to the combined red graph line and represents the predicted future conversions within that 10%. Row 4 - The second red row (relating to the predicted future conversions red graph line) represents the predicted future conversion value within that 10%. Row 5 - The last red row (relating to the predicted future conversions red graph line) represents the predicted future value per subscriber within that 10%. Subscriber profiles within Taguchi® allow you to see a full overview of a subscribers individual profile, custom fields, list memberships and interaction history. To open a users subscriber profile, use the global search functionality to locate the user. After clicking on the user, their subscriber profile will show (as shown). You can manage their invalid and globally unsubscribed status at the bottom of the subscribers profile. Click these buttons to reset or mark the subscriber as either unsubscribed or invalid. These buttons are the key to resolving issues when a subscriber stops receiving emails from you, as most likely they have been marked invalid or have globally unsubscribed for one reason or another. Resetting a subscribers unsubscription status may breach the Spam Act 2003 (Cth), potentially resulting in fines of up to $200,000 per day of breaches. You may be called upon to provide written evidence that this request is made in accordance with applicable laws. The subscriber profile consists of four main sections. This section allows you to add/edit/remove Taguchi® standard fields such as email, firstname, lastname, dob, state, phone, postcode. To edit these fields, simply press the pencil icon. To save a field after editing, press the save icon to the right of the selected field. To add a new field, press the plus icon and select the desired field and enter a value. This section populates the custom fields against the subscriber. To edit these fields, simply click the pencil icon. To save a field after editing, press the save icon to the right of the selected field. To add a new field, press the plus icon and enter the field name and value. This section details the subscriber lists that this profile is subscribed and unsubscribed from. Subscribed lists are green and unsubscribed lists are red. You can add or remove a list subscription by clicking the plus or cross symbol next to the defined list. You can also add new lists to this subscribers profile by clicking the plus button in the top right corner and selecting a list to add this subscriber to. A recent activity that was sent to this subscriber bounced and could not be delivered, the bounce status will display here. An attempt to send an activity was initiated to this subscriber. This subscriber opened an email sent. This subscriber clicked on a link within an email sent. This subscriber was added to a list or to the database. If the user unsubscribed from a list or globally. This subscriber completed a purchase through an email. If a subscriber has an issue with receiving any emails, check this section to see if any recent sends have resulted in bounces. Bounces mean that the email was rejected by the subscribers mail server, this could be due to many different reasons. Read more about bounces in our knowledge base. The Settings administration section is accessed via the tab located on the left hand side of the UI after to the Subscribers tab. These fields will be used and populated when you are editing an activity. For example, if you inserted a firstname variable field in to an article block, the first name field in this section will display in that email in the activity preview. To manage your users, navigate to the 'Users' section under the 'Settings' tab. 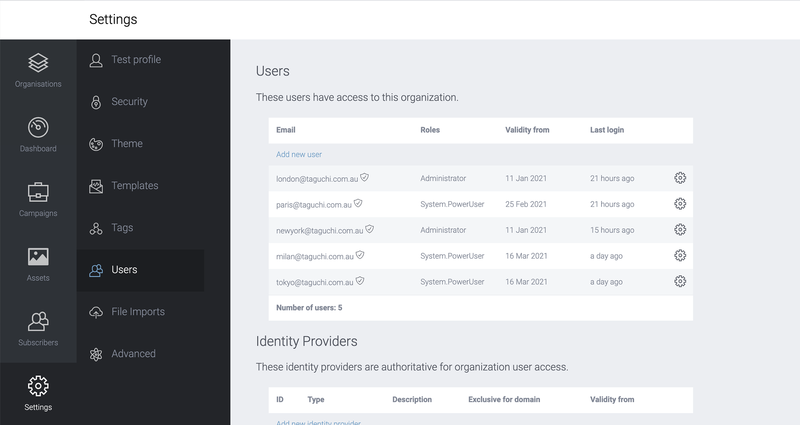 This displays a list of users who have access to your organisation and allows you to add, remove and update user access privileges. A 'security tick' is displayed next to the users who have two-factor authentication enabled on their account. Two-factor authentication can be enabled by following the steps in the article 'Enable Two-Factor Authentication'. You can also add a new user to your Taguchi® organisation by clicking the 'Add new user' link at the top of the table. 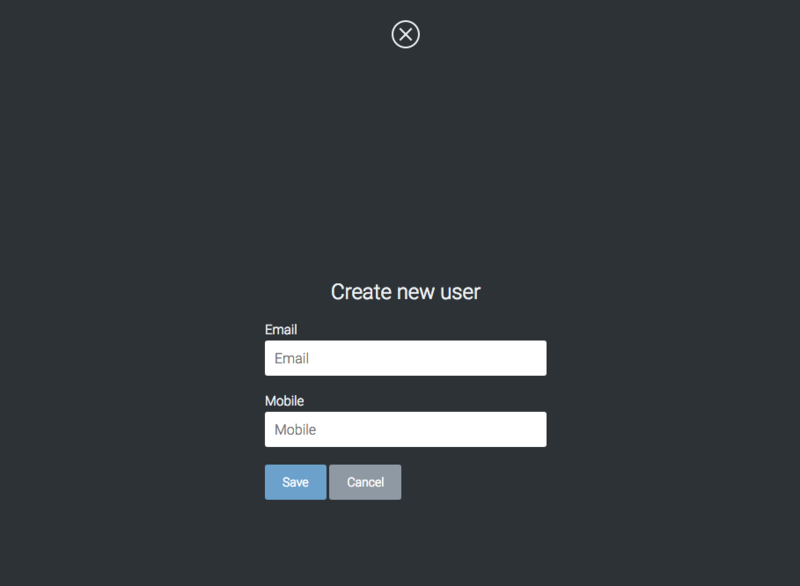 This will launch the new user modal window where you can enter the new user's details. After a user has been added to the organisation, they will be sent an email with further instructions. The settings in this section apply additional layers of security to protect your organization’s subscriber database. You have the option to require two-factor authentication for every user of your organisation. Ensure you send appropriate documentation and instructions on how to enable 2FA to your users before enabling this option. You can also set two-person approval for all extracts. This means an extract will require two people to approve it before it is made available to the requester. The last option is to list IP addresses to whitelist. This will restrict all access to the Taguchi UI apart from those IP's listed in this field. Cluster Tags are recorded against the subscribers profile every time they click on a link. Links within email blocks or individual emails are allocated cluster key words. Overtime this information is used to understand the products or categories that the subscriber is most interested in. Algorithms run in the background to determine if there is a particular pattern for that subscribers’ click through behaviour related to any key word. If so, that subscriber is added to a cluster. This process isn’t based after a few email sends. It may take months depending on the frequency of the communication and subscriber responsiveness. To add a new cluster tag, simply click the 'New...' link at the top of the table.